The perfect cabin for those looking for a truly unplugged North Shore retreat. Poplar Valley Cabin is a rustic cabin with no running water and no electricity, located near the headwaters of the Poplar River. This open lay-out cabin has one queen bed - bring your own linens. There`s also a two-seater outhouse - no indoor bathroom. 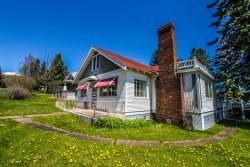 This is the ideal Northwoods getaway for someone wanting to truly unplug. Enjoy nothing but mature trees and the tranquil sound of wild animals as the Poplar River flows nearby. Come on in this unique log cabin home. Large windows allow plenty of natural light - great for a cabin with no electricity. Many say this makes a great family retrea where you can sit around the table and spend quality time together. The gas wood stove fireplace is the only source of heat in this cabin while lending a beautiful focal point. Poplar Valley is a great getaway for a romantic escape to the North Shore with a handy queen bed for an after lunch nap. The cabin does provide a 3-burner stove and gas refrigerator for preparing food during your stay. The sink does not have running water. The beautiful gas The cabin is small but has plenty to offer those who seek an adventure. When you visit in the summer you will find trees in full bloom, wild flowers, and plenty of wildlife. The Poplar River flows nearby and provides soothing, tranquil sounds to add to the cabin`s ambience. Pick some daisies for your loved one. They make a great centerpiece for the cabin`s table The driveway into the property. Once you`re here, your Northwood`s adventure can start. The cabin is great in all seasons - in the fall the leaf change in this area is enchanting. This cabin truly allows you to appreciate all four unique seasons in Northern Minnesota. With leaves so vibrant they almost make the trees look like they are on fire, many say fall is their favorite season here. Poplar Valley is a winter wonderland with deep snowfalls most years and easy access to snowmobile trails. You may not hear the river running or the bird chirping in the winter, but many say the peace and quiet here is unlike anywhere else. Many report that the trek to the two-seater outhouse in the middle of winter is invigorating. Even in winter you can still spot many deer roaming through the trees. So whether you come in spring, summer, winter, or fall, Poplar Valley Cabin is a favorite among those seeking a unique, unplugged retreat. Over the river and through the woods…brings you to Poplar Valley Cabin. Set near the headwaters of the Poplar River in heart of maple syrup country, there are countless wilderness adventures beginning from the steps of this cabin. A short walk brings you to Barker Lake. Biking/hiking trails run adjacent to the property while the rest of the Lutsen area amenities are less than a 15-minute drive away. This handcrafted rustic retreat is set up as a one bedroom studio with a sleeping loft. Bring your own linens (sleeping bags), towels and toiletries (meaning all paper products, including toilet paper). You’ll love the two-seater outhouse – the views are outstanding. There is no housekeeping or electricity (guests clean the unit upon departure). You will want to bring in your own water (however, in a pinch there is water available from an artesian spring). This cabin is perfect for guests who can appreciate the solitude and beauty of the Northern Minnesota Wilderness. Nothing but the occasional wilderness creature (deer, wolves, the beloved red squirrel, etc.) disrupts the otherwise quiet landscape. It's a truly inspirational getaway. *Year-round accommodations available. Gas stove for heat. Firewood is NOT provided for outdoor fire-ring. At Poplar Valley Cabin your are unplugged and able to tune into nature. The cabin provides a peaceful, serene retreat from the hustle and bustle of real life where you can sit out in the yard and see nothing but trees and hear nothing but the birds chirping in the trees while the Poplar River flows nearby. You are sure to leave refreshed and relaxed after a few days in the beautiful Northwoods. Pets are welcome with an additional fee. 2 pet maximum. This cabin is open year round. Always very helpful when I called to ask questions and book the reservation. We loved the property. We are outdoorsy people who typically would go camping, but have found that with the addition of our dog, it is challenging to go camping with our dog and expect to still do the same activities that we would like to do (fishing/canoeing, site-seeing, etc). We loved the idea of renting the Poplar Valley Cabin because it is rustic enough (and affordable!) to keep true to our outdoorsy nature, but gave us a place to securely leave our dog when we wanted to do activities that would be easier without him. Recommendations: 1) Clean the outhouse... I know its and outhouse, but it'd be a little bit more enjoyable to use if it wasn't as gross as it is... 2) Leave instructions for the gas fireplace - we couldn't figure out how to turn it on 3) Fix holes in screens with new screens, not tape. The tape is a good quick fix, but hopefully the cabin will get some some new screens for the windows. Tammy at the front desk was very nice and helpful! Really enjoyed the rustic aspects of the cabin, which made the price more affordable. Good location too! Awesome view and gorgeous little cabin wirh full windows overlooking Minnesota mountains. Fresh air and incredible stars! Much less rustic than we were expecting with zero electricity or running water. The rain water barrel was full and the gas provided us with a fireplace, stove range, a refrigerator, and gas lamps. Trek to the outhouse was fun. My kids loved it! The Poplar Valley Cabin was truly a gem! This cabin provided a true wilderness experience and at a lower price than other similar priced "camping cabins". The propane stove, lamps, refrigerator, and gas burners were greatly appreciated and added to the experience. The beautiful view and fire pit provide a beautiful outdoor experience.The value of this cabin is outstanding. We will be sure to stay here again! This was our second stay and it was wonderful again. We don't need much when we are hiking and relaxing and Poplar Valley cabin is perfect. This year we did miss the wood burning stove though, but we understand sometimes things like that have to change. We have shared pictures on Facebook of our weekend and several people have asked about the cabin. We will always pick this cabin when traveling to Lutsen because of the affordable and realistic cost. Thank you!